Last night was about as perfect as a lunar eclipse can get (other than the cold). The skies were completely clear. 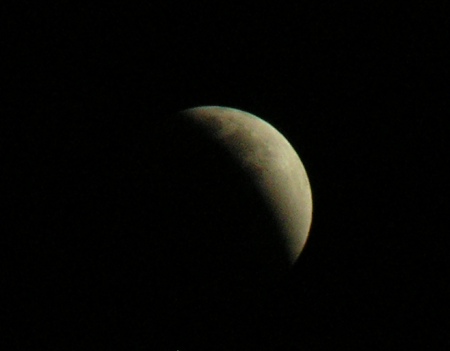 The total eclipse was at a late enough time (10:01) that it was dark enough, and not too late that you had to get up in the middle of the night to see it happen. We went out every 20 minutes or so starting at 8:45 and discussed what was happening in between. 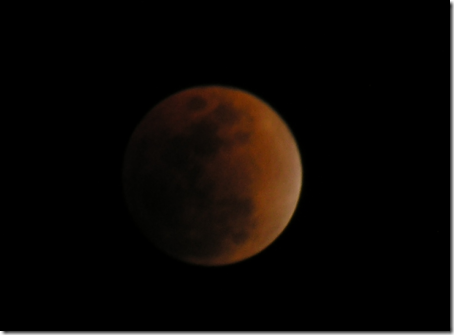 I had forgotten just how dramatic the red color of the moon was at the peak of the eclipse. We didn’t watch the "other side" of the eclipse – maybe in 2010 it will be a summer event and we can camp out under the moon.